Starting today, we’ll be featuring guest articles from comic retailers every month talking about their business, industry trends and what’s happening on their side of comics. To kick things off, we have Patrick Brower, the co-owner of the Eisner Award winning shop Challengers Comics + Conversation, talking the recent second edition of the Batman Day event DC Comics is putting on. Here’s what Patrick had to say about his shop’s experience with it, and big thanks to Patrick for taking part. Last summer, DC Comics decided to celebrate the 75th Anniversary of Detective Comics #27, the first appearance of Batman. Wednesday, July 23, 2014 was selected as the date (although Detective Comics #27 had a May 1939 cover date) and retailers around the world were invited to participate in a celebration of all things Batman. That particular date fell during the 2014 San Diego Comic-Con, so while the store I own—Challengers Comics + Conversation in Chicago—actively participated in the event, I was not on-hand to work it as I was in San Diego. Nevertheless, Challengers co-owner W. Dal Bush and Jimmy P$ Hayes ran the event and it was very, very successful. Challengers did double the normal Wednesday business on Batman Day 2014. How did we do it? What did we do? Oh, good questions; thanks for asking. I say “participating” because you had to officially participate by telling Diamond Comics (our only distribution source for DC titles) you wanted in. 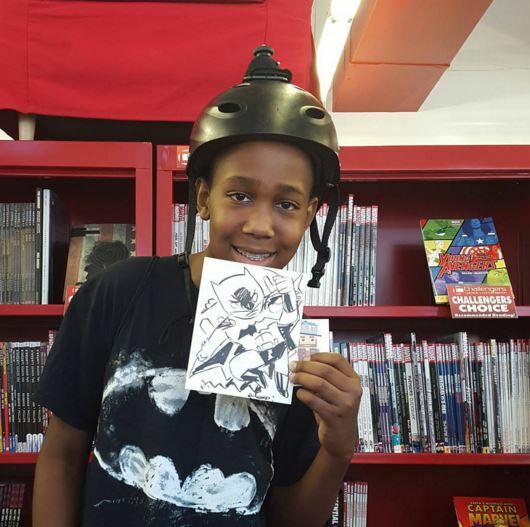 So, we gave out the free comics, limiting one per person, and we gave out the masks with a Batman-related purchase. The sketches were free and while Brian generously donated his time, we bought him his comics for a few weeks after the event. That’s what we did. And while Ashly Challenger and I were in San Diego, Dal and Jimmy did a great job of taking pictures and posting them to our various social media sites, mainly of people in the masks and Brian’s sketches. The day after, I was at a retailer breakfast in San Diego, and people were sharing stories of how well the event did for their respective stores. I even tracked down several DC staffers telling them of our success and mentioning how great it would be if they held this event next year, too. Well, this is next year. 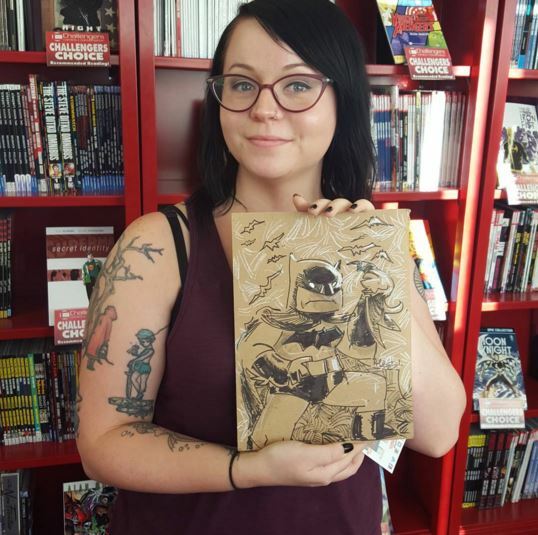 DC Comics held a second Batman Day, this time on Saturday, September 26, 2015. I don’t know why that day was chosen, but I’m not bothered by it. Everything you’ve read up until now has been context for this part…Batman Day 2015. Once again it was an ‘opt-in’ event and, once again, Challengers participated (and this time I actually worked it). This year, DC didn’t really offer us specific Batman Day promotional items. For the launch of DC YOU, they did offer cardboard masks of Robin, Batgirl and Harley Quinn, as well as temporary tattoos of Bat-Mite and the “R” from We Are Robin. But these items were bundled with other DC YOU items (a Justice League poster, a Bizarro symbol tattoo, a copy of the Daily Planet) and you ordered them in groups. Also, they were ordered for the June 2015 launch of all these new and returning titles, well before we knew of Batman Day 2015. There were still two of last year’s masks available if you chose to dig up that item code and go looking for them on your own. This was not pointed out to us, as far as I can recall. 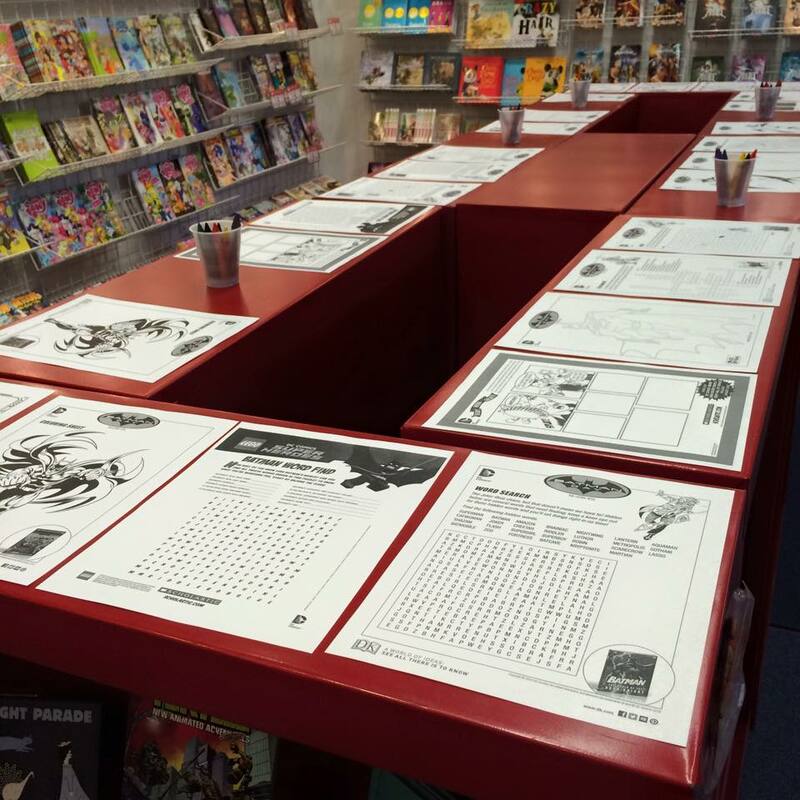 What DC did give participating retailers was a downloadable bundle of Batman activity pages in PDF format. They included coloring pages, mazes, word finds, drawing lessons and origami instructions, but mainly coloring pages of a variety of different art styles. The catch is while the PDF bundle is free, if you want to use any of the pages, you had to print them out yourself. Oh, the masks were also in the PDF bundle, but the thought of printing them out full color on cardstock and then cutting them out by hand and adding the string was just more money and effort than we wanted to put in. But everything else, we did. We took the PDFs to our local FedEx Office and printed out two copies of every activity page. That gave us a pretty significant pile of activities for kids, a facet we did not have at the 2014 event. And it wouldn’t be Batman Day without a free Batman book to hand out, this year being Batman Endgame Special Edition #1, a book that we also bought at 15¢ per copy. There was also a consignment offer from DC for this. There may have been last year, too, I just don’t remember if there was. What that means is DC offered us a number of Batman-related graphic novels that we can order and not have to pay for until they sell. If they don’t sell, we can return them, but there is a minor restocking fee that gets charged for anything we return (not per book, per title only). The books offered this year were Batgirl TP Vol 1 The Batgirl of Burnside; Batman Adventures TP Vol 1; Batman Arkham Knight HC Vol 1; Batman Dark Knight Returns TP; Batman Earth One TP; Batman Earth One HC Vol 2; Batman Hush Complete TP; Batman: The Killing Joke Special Ed HC; Batman Lil Gotham TP Vol 1 and Vol 2; Batman TP Vol 1 The Court Of Owls; Gotham Academy TP Vol 1; and Grayson HC Vol 1 Agents Of Spyral. All in all, it was a nice mix of old and new that incorporated some recent Bat-successes, like Batgirl, Grayson and Gotham Academy. We ordered between 10 and 25 copies of each book. And before I get too deep into the results of the day, we sold at least one of each title. Now, there are retailers that are disappointed in DC’s involvement in the day this year, especially since Jim Lee was quoted as saying to CBR, “We have a lot of great things that we gave to retailers — free comics, temporary tattoos, posters, masks, there’s a huge sale on Batman-related merchandise — so here’s your opportunity to get together with all the people that are Batman fans and celebrate arguably the greatest superhero in the world.” It’s just too bad that’s not true. First of all, DC didn’t GIVE us anything, save for the PDFs, and those were not in a hand-to-customers format. The comics aren’t free to us. Those promotional items weren’t free nor were they for Batman Day specifically, and there was no “sale.” The consignment deal is at our normal discount rate, just with payment deferred until after the event. He said all this while signing at a California Barnes & Noble where customers had to buy a $40 Batman Hush Unwrapped HC in order to meet him. 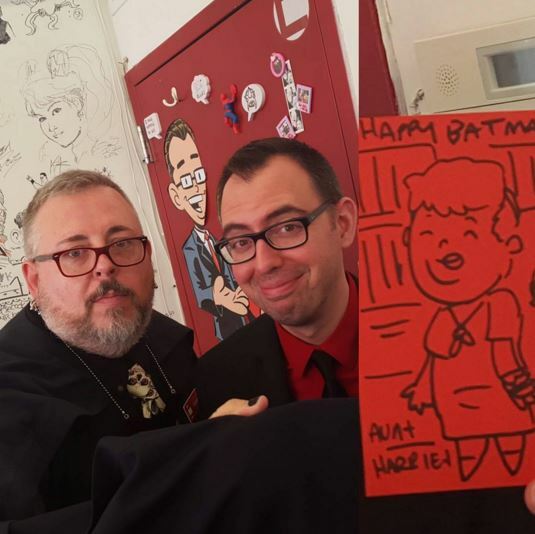 The fact that one of the most famous comic book artists of modern times, an artist intimately associated with Batman, chose to celebrate Batman Day outside of a Local Comic Shop is sad, but that’s not what we’re here to discuss. 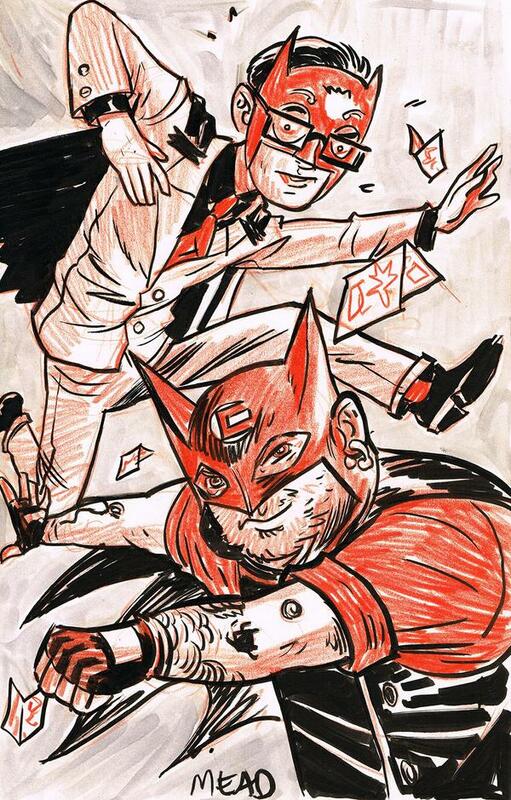 Ultimately, my question is what does DC owe the direct market – the local comic shops – in regards to Batman Day? Batman Day 2014 was a celebration of the character’s 75th Anniversary. It was supposed to be a one-off. But it was such a success that retailers, myself included, requested DC bring it back. DC is losing money on this. The mere fact of selling us a full size, full color comic book at 15¢ a copy – which is about 10¢ less than they charge for their Free Comic Book Day offerings – is losing them money on every copy. I understand putting forth the effort last year for a specific anniversary, but this time it was our idea and DC shouldn’t have to lose money for us again. Sure, it would be great if they had a whole new line of Bat-related promotional stuff we could get for cheap to give out, but ultimately, we didn’t need it. That’s it. Oh, and we played Batman movies in-store all day (we usually do not play movies). We also hung up rubber bats around the store (also from the dollar store). Last year we didn’t decorate. And here’s the best part; everyone that came in was excited to be there. It was a day full of smiles and a day where everyone left happy. Batman Day is like a second Free Comic Book Day for the year, with much less set-up, hassle and money spent ahead of time. Ultimately, as a comic book shop, you get out of events what you put into them. While we didn’t kill ourselves getting ready for this event, we did work with what we had and not only made the best of it, it turned into a well-received event, and that’s what we’re looking for. Would it be great if the co-publisher of the second largest comic publisher actively supported the market this event was created for? Sure it would, and I mean that less about not signing at a shop and more about the misinformation he spread to the comic-buying public. But Batman is bigger than him. Batman is bigger than Challengers. Batman is universal and we’re excited to celebrate an iconic character that was born in comic books and continues to thrive in comic books. While everyone who came in on Batman Day has no doubt watched Batman cartoons and movies and played with Batman toys, they were there for Batman comic books. That’s why we’re here, too. Visit Challengers Comics + Conversation when you’re in Chicago, but if you’re nowhere near them, check them out on the web, Twitter, Facebook, Instagram and Tumblr. It’s almost as good, I swear.